The cause of a fire that destroyed a local family’s home Saturday on Blevins Road is still under investigation today. Eddy County Fire Marshal Joshua Mack says the official cause has yet to be determined but that the fire appears to have originated from the property just west of the home that was consumed at 19 W. Blevins Road. That residence belonged to the Knowlton family, who lost everything in the blaze, including family vehicles. One of those belonged to their son, a senior preparing to graduate from Artesia High School. Mack says the fire spread quickly due to high winds in the area Saturday afternoon, but firefighters worked diligently to prevent further significant damage to nearby homes, as well as any explosions from several propane tanks in the area. A residence to the east of the Knowlton property sustained minimal damage, Mack said. 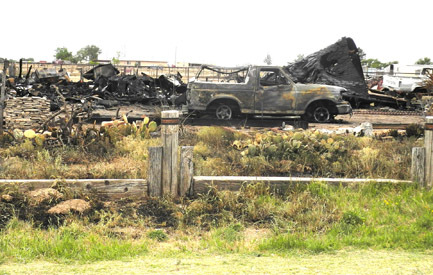 Three sheds were reported as total losses, and nine vehicles, one dump truck, and a motorcycle were damaged, as were numerous flatbed trailers. Several area fire agencies responded to the blaze – which was reported just before 6 p.m. Saturday – including the Atoka, Sun Country, Riverside, Cottonwood, Loco Hills and La Huerta Volunteer Fire Departments and the Artesia Fire Department. Mack said firefighters had the flames contained by 7 p.m., and crews remained on scene into the evening for mop-up work. Investigators were also out until 1:30 a.m. Sunday gathering evidence and examining the scene. The State Fire Marshal’s Office has been brought in to assist in the investigation. A GoFundMe account has been established for the Knowlton family at gofundme.com/knowlton-family-fire-aid for those wishing to make monetary donations online. The three-day-old campaign has currently raised $1,845 of its $5,000 goal. Donations of clothing and other items are also being accepted and may be dropped off from 9 a.m. – 5 p.m., Monday through Friday, at 1502 S. First St.
Mack also urges Eddy County residents considering burning to contact the Eddy County Regional Dispatch Authority (REDA) at 575-616-7155. “We highly encourage people to call the dispatch center to notify us if they’re going to be doing any burns, so we can let them know if it’s a red-flag day and whether or not it’s allowed,” said Mack.